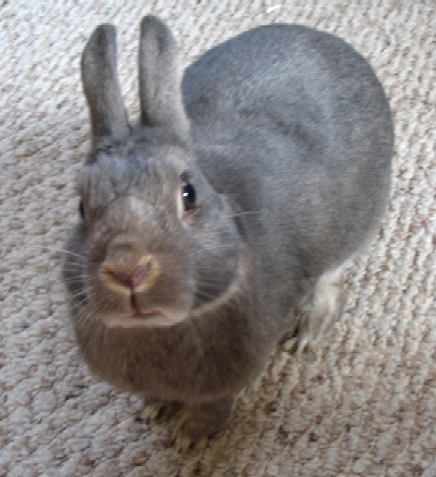 My wife and I adopted Grayce, a 3 yr old gray and white dwarf, from a very nice foster mom in Lafayette in ’03. At the time, our family also included a kitty named Ruby and a hamster, Hammie. 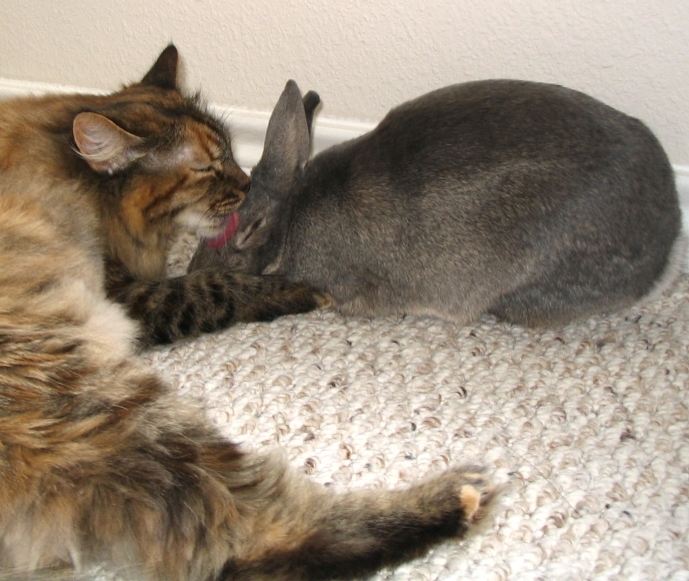 They all got along great from the get-go… we weren’t afraid to let Grayce hop free in our bunny-safe home. Since then we have traveled from Fort Wayne to Sacramento, California, for an exciting job opportunity. We were out there for 3 years, during which we had to say goodbye to our lovely Hammie… but Grayce and Ruby got each other through it (Grayce loved playing with Hammie when we would put her in the hamball and let her travel the apartment until her little stuffy cheeks were content). In Sacramento we were brought to 2 new beauties, Tiki– a chihuahua mix, and Tiger– a long-haired domestic kitty (all rescues!). While harmony was still in tact, an even more special bond immediately grew between one-year-old Tiger and her “sissy”, Grayce. They are amazing together. So, to wrap things up, we wanted to thank you. Tiger and Graycie do too. We moved to Raleigh, NC, in April… and after yet another smooth cross-country trip, everyone’s safe, healthy and happy (and everyone rode together in the car with us– we kept each other sane). I’ve included two great pictures– one with just Piglet (Grayce has a cute little snort she offers up when she gets excited), and the other is the two close-knit interspecies adopted sisters, Tiger and Grayce, while bonding in an afternoon bath. Does anyone else find it amazing that these people moved with their animals cross-country twice, and yet last week some woman couldn’t take her rabbit when she moved across town? Hooray for happy endings and loving pet owners! Wow is that ever cute (and responsible!). I love good pet owners. I moved 2500 miles with two cats in March and I’ll tell you it was really a non-issue. So easy and only cost about $150.